"He that has two cakes of bread, let him sell one of them for some flowers of the Narcissus, for bread is food for the body, but Narcissus is food of the soul." 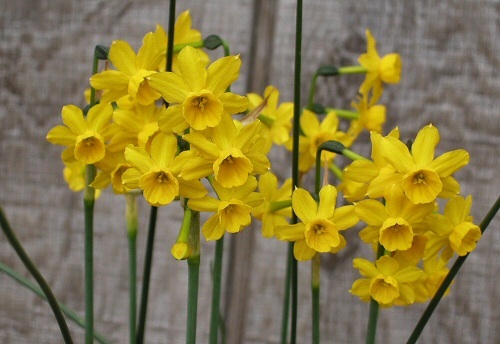 Native mostly to Europe, Narcissus have been cultivated and studied for thousands of years. The ancient Greeks wrote about them, and they have been popular in the UK at least since the reign of Elizabeth I. Botanists have argued about their classification for almost as long. 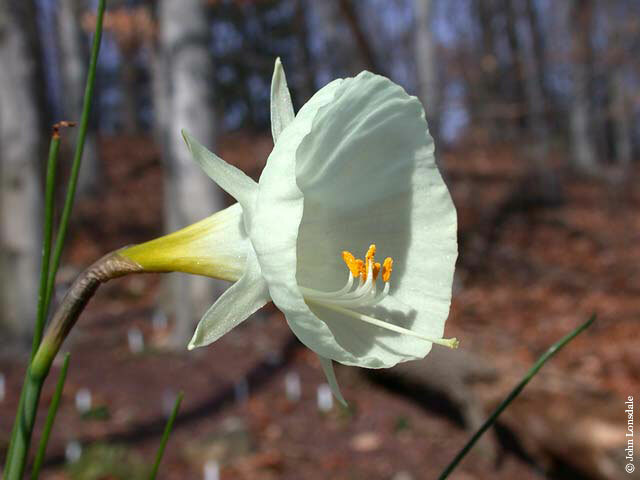 According to bulb expert Brian Mathew, some botanists recognize as few as 26 Narcissus species, while others identify more than 80. The distinctions between species are often subtle, disputed, and difficult for casual observers to spot. 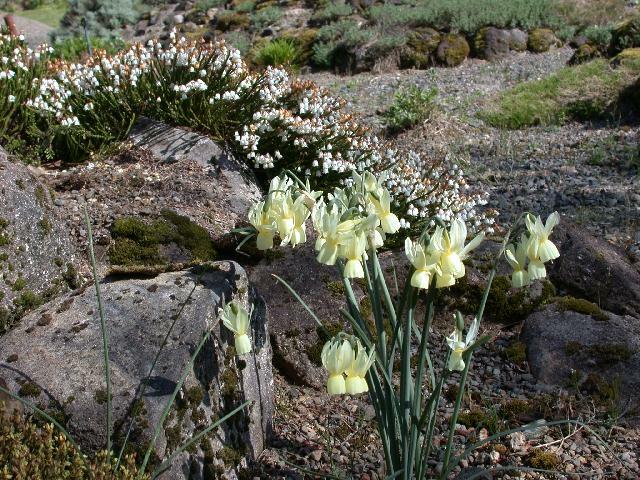 Ian Young of the Scottish Rock Garden Club posted a useful photo essay highlighting some of the anatomical differences that botanists use to distinguish between Narcissus species. You can find it here (scroll down about 2/3 of the way on the page). 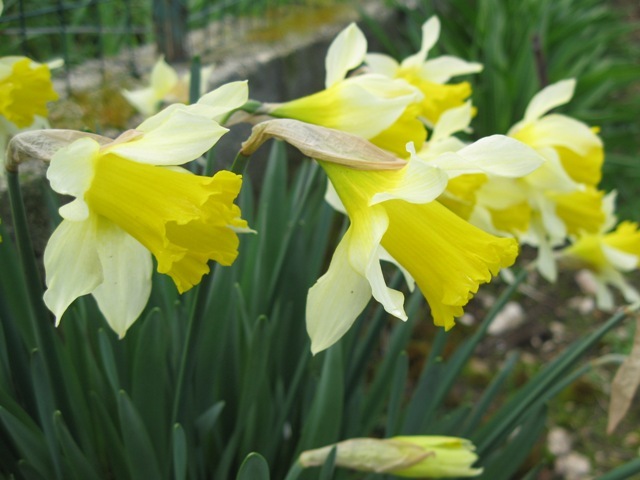 Because of all the overlap between species, there is no single accepted taxonomy for Narcissus. 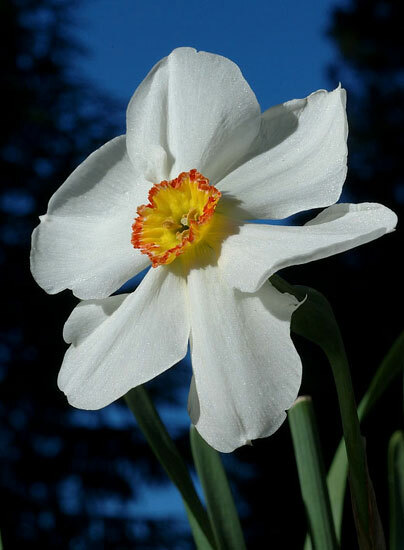 We have mostly followed an overview written by Mathew in 2002 for the book Narcissus and Daffodil: The Genus Narcissus, with additions submitted by PBS members. We invite Narcissus experts to add their own comments and corrections. 1a. Subgenus Narcissus section Narcissus. The "pheasant's eye" Narcissus. Spring-blooming single flowers with wide, flat coronas (central cups). Mathew places two species and about ten varieties in this section. Group A has smaller flowers (10 species). Group B has larger flowers (24 species). 1c. 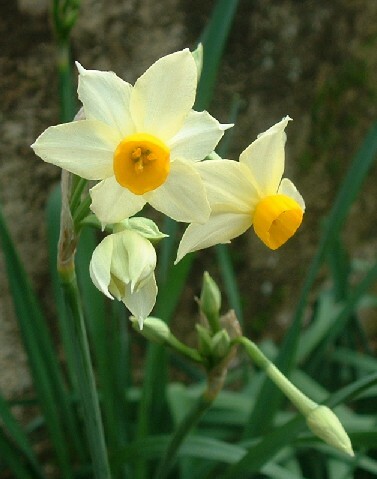 Subgenus Narcissus section Ganymedes. "Angel's tears" daffodils. Small drooping flowers with swept-back petals and a bell-shaped corona. One species with four varieties. 1e. 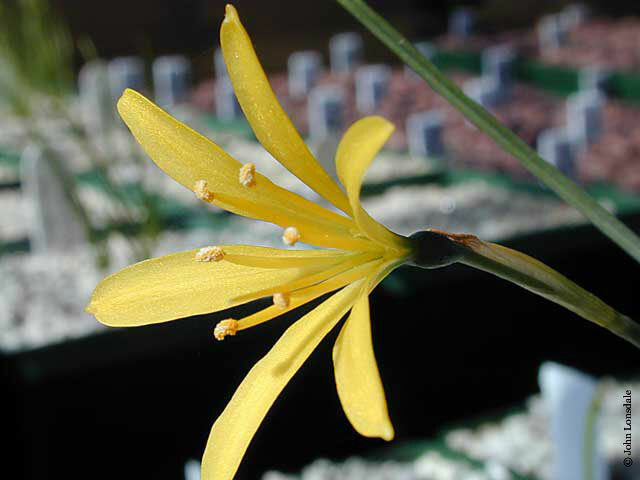 Subgenus Narcissus section Tapeinanthus. Autumn-blooming flowers with little or no corona. One species. 2a(i)A. Subsection Hermione Series Hermione. These are the colored forms, 10 species. 2a(i)B. Subsection Hermione Series Albiflorae. These are the white ones, eight species. 2a(ii). Subsection Angustifolii. Autumn-flowering, narrow leaves, very shallow coronas. One species with several varieties. 2a(iii). Subsection Serotini. Leaves almost thready, flowers in Autumn. One species. 2b. Subgenus Hermione section Aurelia. Autumn blooming, several flowers to an umbel, very small corona. One species. 3. Subgenus Corbularia. These are the "hoop petticoats," flowers with a big conical corona that makes up most of the flower. They generally bloom in autumn to winter. Mathew noted that there is a lot of overlap between the species listed here, making this classification unsatisfactory. But he said it would be even more unsatisfactory to lump them all together into a single species. Eight species, with numerous varieties and subspecies. 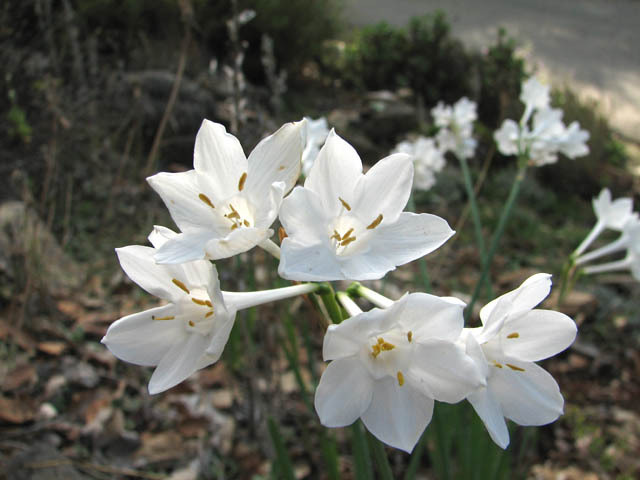 To see our index of Narcissus species, click here.